I like teaching adverbs to students because it is very simple, there are only a few exceptions and you can see that they have learnt something immediately. 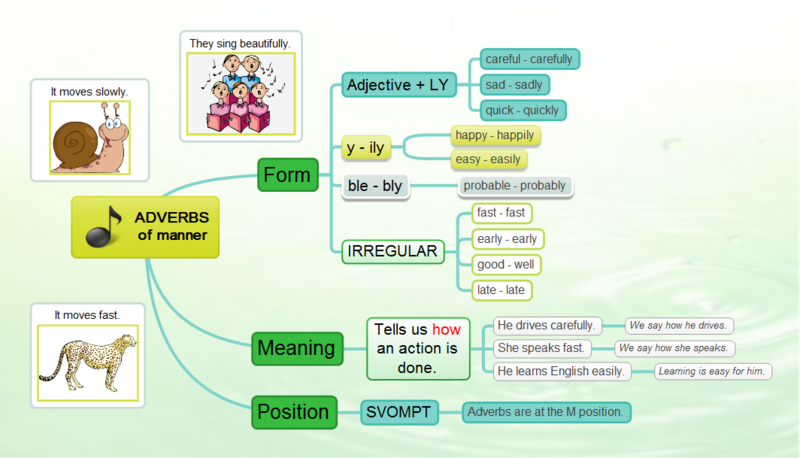 Adverbs are an easy grammar point and students can use them in the same lesson and feel that they achieved something. Once you or your students understand adverbs it is time to practise forming the adverbs in games. Adverbs – half a minute game. You have 30 seconds to put the letters into the correct order to create the right adverb. Adverbs – Teacher invaders. Your task is to shoot all the invaders but from time to time you have to form an adverb from the given adjective. Adverbs – Penalty game. In this game you should choose the correct option to complete the sentence. If you get it right you will have a chance to shoot a penalty. Adverbs – Hoopshoot game. Choose the correct option and then score. I hope you enjoyed the lesson and that your knowledge of adverbs is much better than it was a few minutes ago. If not look at the links section, too. If you are looking for another explanation of adverbs, you can find one at British Council site. Here is a great video explaining what adverbs are. I believe it can be used for teaching English as ESL too. Enjoy. pls provide me other grammar game please. Hi, Thanks for sharing the mind map. Which program do you use to make them? Cheers. I used Mind maple for this one. It is free. SVOMPT is the word order of an English sentence. S = subject (WHO) V = verb (does) O = object (WHAT) M = adverb of manner (HOW) P = place (WHERE) T= time (WHEN). one thing that I think I’d never understand. I’m having a look forward for your subsequent submit, I’ll attempt to get the hang of it! Is it alright if I tweet about this post? I am afraid, it is not possible. The games need to be online to work. I hope they don´t. Please, check back later and let me know.